RADAR CHECK: Most of the showers and thunderstorms across Alabama at mid-afternoon are over the southern half of the state; they are producing heavy rain, gusty winds, lots of lightning and some small hail as they move east. These storms are south of an outflow boundary left over from morning storms over the northern part of the state. We will still carry a chance of thunderstorms for north Alabama tonight, however. Temperatures are mostly in the 86- to 90-degree range, with 70s where rain is falling. 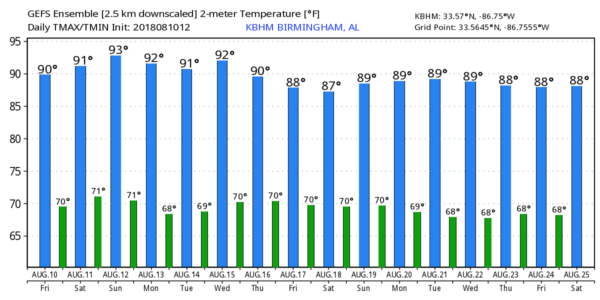 THE ALABAMA WEEKEND: Saturday looks relatively dry for much of the state as the air becomes drier; any afternoon showers should be very isolated. Otherwise, Saturday will be partly to mostly sunny with a high at or just over 90. Sunday starts with a good supply of sunshine during the morning, followed by some risk of scattered afternoon and evening storms. The chance of any one spot getting wet Sunday is about 1 in 4, and the high will be near 90. NEXT WEEK: Scattered storms are possible Monday, but Tuesday and Wednesday look fairly dry with only isolated showers. Moisture levels rise late in the week with an increase in the number of showers and storms Thursday and Friday. Highs through the week will be near 90 degrees. TROPICS: A low-latitude tropical wave is in the Atlantic between the Lesser Antilles and the coast of Africa. 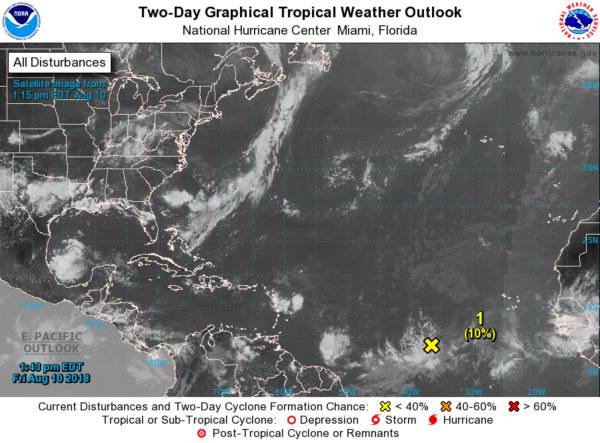 The National Hurricane Center gives it only a 10 percent chance of developing over the next 48 hours because of dry air and cool sea-surface temperatures. The rest of the Atlantic basin is quiet, including the Gulf of Mexico.